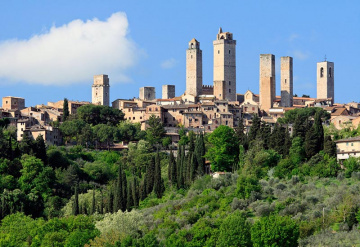 From Castelvecchi Farm, a countryside hotel in Radda in Chianti, Tuscany, it is possible to reach San Gimignano in approximately one hour by car, travelling along either the provincial road or the Firenze - Siena motorway. 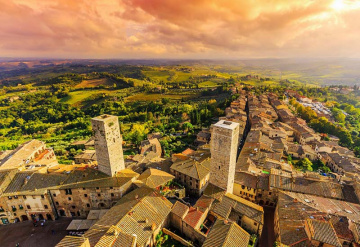 The Borgo (village) of San Gimignano boasts a characteristic historical city centre, listed as UNESCO cultural heritage thanks to its medieval architectural elements which have remained intact. 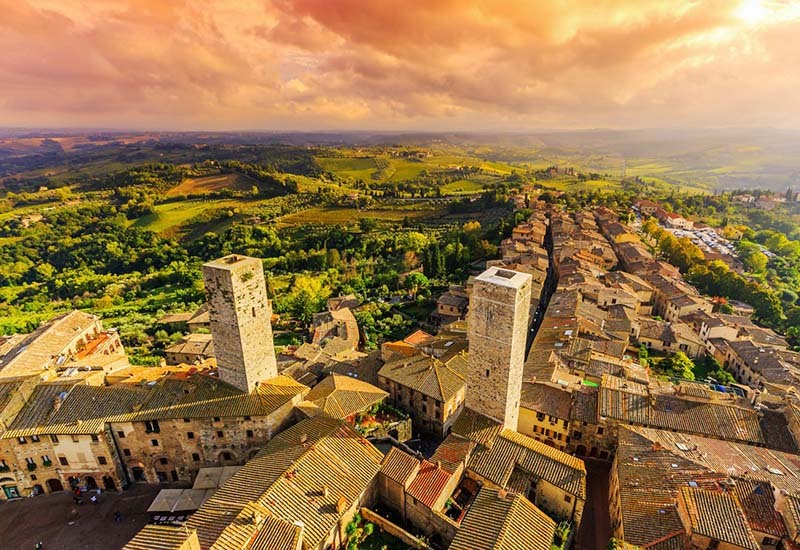 San Gimignano, despite having undergone numerous restorations in the 19th and 20th centuries, has more or less retained its 13th and 14th century appearance and is one of the best examples in Europe of urban organisation in the Italian city-state era. 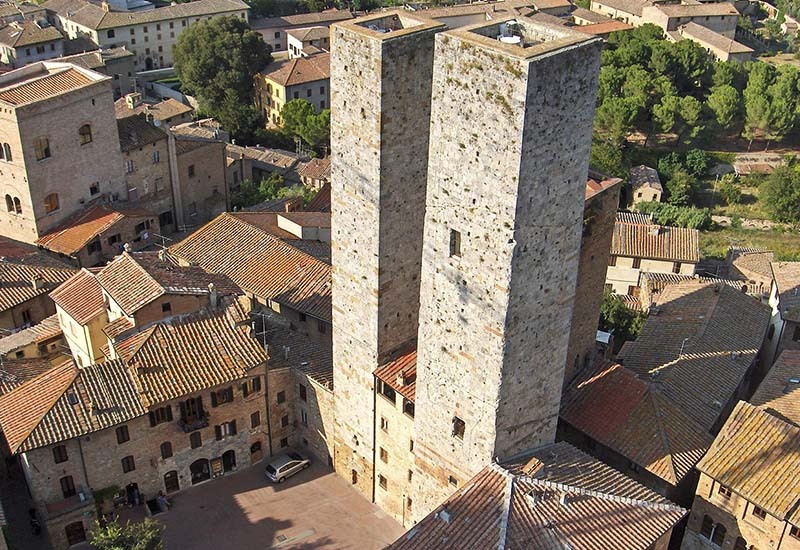 San Gimignano is above all famous for its medieval towers, worthy of being nicknamed the Manhattan of the Middle Ages. In one full day in San Gimignano it is possible to visit and admire the most important places and monuments. 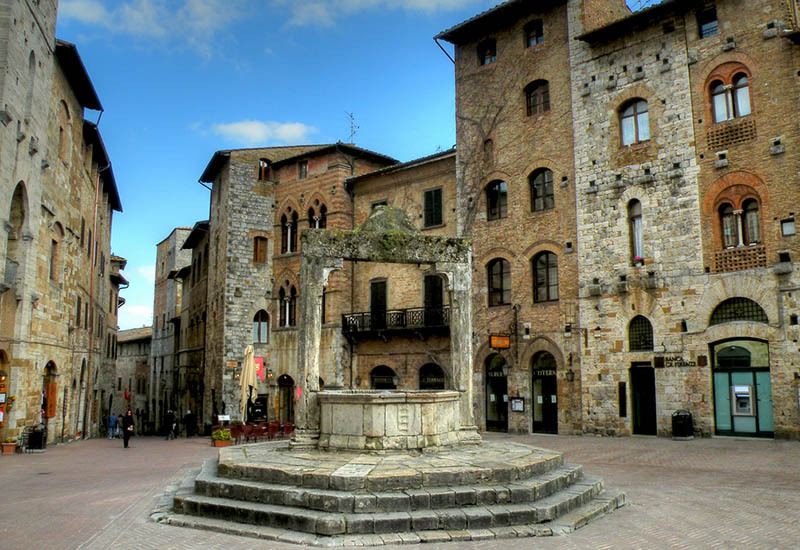 We begin from Piazza del Duomo, which houses the twin towers, the 14th century Duomo (Cathedral) and the old Palazzo del Podestà with its tower known as Rognosa, which until the 14th century was used as a prison. 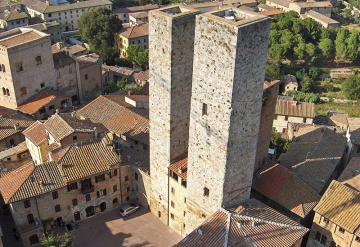 Today the suggestive Teatro dei Leggieri theatre is located inside the tower. We then move on to the Palazzo Comunale (Mayor’s Palace) which is also in Piazza del Duomo. 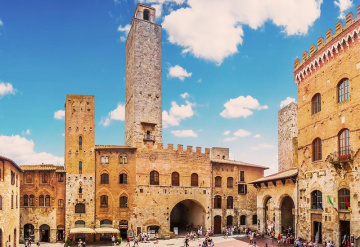 This building preserves an interesting art gallery where you can admire artworks that date from the second half of the 13th century to the 16th century, including an altar piece by Pinturicchio painted in 1511. It is also possible to visit the Torre Grossa, the city's tallest tower. As we continue to admire the artistic beauty of San Gimignano, we can stop at the Palazzo della Propositura located between the Duomo (Cathedral) and Palazzo Comunale, where important frescoes can be see, such as the Annunciation of Ghirlandaio. Of significant emotional impact is a visit to the Casa di Santa Fina, a young blessed girl who spent much of her short life immobilised on a wooden table in the cellar of her poor home. The home, which has now been transformed into a chapel, can be visited every 12th March, on the Saint's celebration day. If you have some more time and energy, you cannot miss the Fortress of Montestaffoli, where "La Giostra dei Bastoni" (a knight's tournament) is celebrated within the medieval festival at the end of June.